If you're allowed to wear jeans to work, consider yourself lucky—it makes getting dressed for the office infinitely easier. That being said, just because wearing jeans to work is allowed per your dress code doesn't mean you can wear them with just anything. Unless literally anything goes at your office, you may want to save the trainers for the weekend and focus on the shoe styles that make jeans completely work-appropriate. And that's where we come in. We scoured hundreds of street style images to show you which shoes make denim look polished enough for work. Among them, you'll see heels, flats and ankle boots you may already have in your closet, and if not, we rounded up some of our favourites on the market. They Will take you from morning meetings to business lunches to after-work drinks with ease and will look incredibly chic with a variety of denim styles, including skinny jeans, cropped flares and high-waisted wide-leg styles. Keep scrolling to find out which seven shoe styles every working girl who can wear jeans to the office needs. Luckily, one of the biggest shoe trends right now (kitten-heel mules) dresses jeans up the perfect amount for the office. We especially love this combo styled with a dress over the jeans. If you want something comfy (an essential for casual Fridays), you can't go wrong with a pair of loafers. We think they look particularly cool with skinny jeans. This may seem like a no-brainer, but the ultimate no-fail denim pairing for the office is classic pumps. They add an air of professional polish to any style of jeans. Since we all pretty much live in ankle boots this time of year, it's a plus that your boss definitely won't give you a disapproving look when you wear them with jeans. Another flats style we love wearing with jeans is slingbacks. In fact, many pairs on the market look fancier than most heels. Oh, and it's an added bonus that they give any outfit strong French-girl vibes. 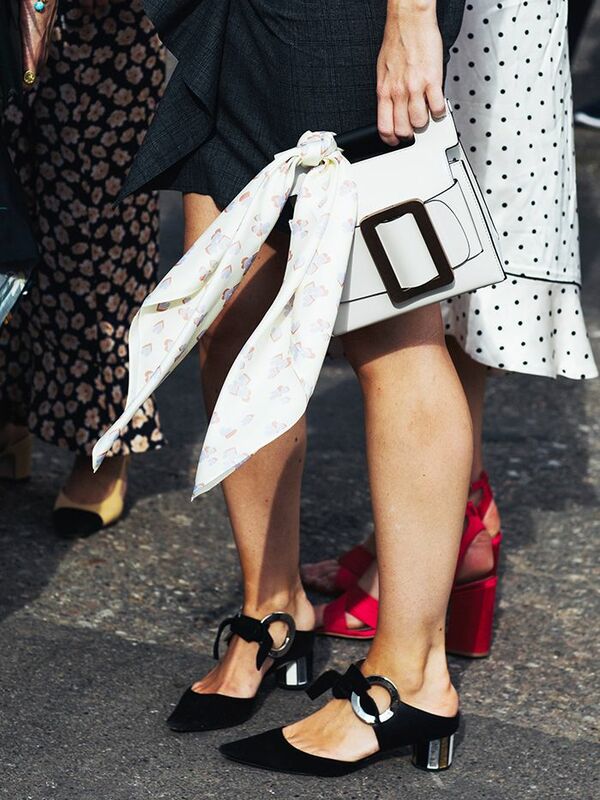 On especially chilly days, you’re probably not going to want to wear pumps to work. Instead, we recommend tall leather ankle boots. They’re an instant skinny jean–elevator. Aren’t you glad that block heels have become a classic as opposed to a passing trend? Thanks to their walkability and how sophisticated they make jeans look, we definitely are. Still looking for more inspiration? Why not have a look through our spring/summer trend report.